To be honest though, after the crazy adventures of the first two games, Nathan probably did want to have it all end in U3. The problem then is he never does. So I was left having to put up with whining throughout the course of the story. Not just from Drake, but from every character that got screen time. Everything just felt tired to me. The only brand new thing they added was the desert experience. I say experience because that is exactly what it is. It is truly amazing to witness. Of course the only way Naughty Dog thought to incorporate it though is with Drake getting lost in it. Because, as usual, the plane he is on has a spectacular crashing scene. Why? Well because the dumb asses on the plane throw grenades and well grenades blow up. 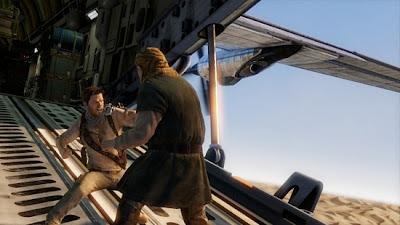 There is also the smart one who opens the cargo hatch to throw Drake off the plane....instead of just snapping his neck when he was squeezing the life out of him....again, smart people. Don't get misled though the entrance into the desert was a spectacle to watch indeed. If Drake hadn't killed him. I would have fired him for being a dumbass. That is something else about Uncharted 3 almost everything in the game just doesn't seem to be....what's the word....believable. In Uncharted 1 and 2 everything that happened had a great deal of thought and logic behind it. U3 doesn't have that. Everything in the game is full of insanely near misses and constant feats of super human abilities. I swear every single minute of the game you will see Drake in a near dead expression and stance. No matter what is going on. Granted in the franchise he stars in everything turns into a life or death situation or decision (EVEN....DRINKING....WATER.....). I would like to say that Drake's journey concludes with a never attempted before climax....but it doesn't. Anyone see Ironman 2? Anyone? Anyway, Nathan Drake's story fizzles out. Maybe lack of trying is the new way to innovate, I'm not really sure. The thing is I never saw the Uncharted games as a "trilogy". It wasn't until a few months before release that Naughty Dog started saying the U3 will complete the story of Nathan Drake. WHAT?!? How? Why? When did Nathan's story become a trilogy??? By the way, how do you complete something that never really develops? Now you might be asking yourself, could the review have the most questions in it from Jeff? Why yes, yes it is. The reason for that being, I don't know what the hell was suppose to conclude. Nothing ever really develops. I have more questions now than I did at the end of either 1 or 2 and those games were suppose to leave me with questions. U3 was suppose to "conclude" those non-existent questions. You spend the entire game hunting down a ring (the one ring Nate has had all the way through the first two games) because he fake traded it for fake British pounds. Of course Drake doesn't even care about whether the trade was real or not. The fake trade was with a fake copy of the ring. Either way Nathan and Sully want the trade to happen. Whether they lose the ring or not. 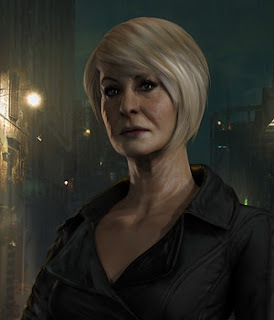 So the bad guys, who are led by Kathrine Marlowe, have a fake ring that they don't know is fake. The whole thing was to lure out Marlowe so Nathan could track down their hideout. Brilliant strategy, BUT they get caught inside the hideout they sneak into. Typical and they lose the real ring and the information to find the famed "Atlantis of the Sands". Overall, Uncharted 3 feels rushed. Which is incredibly sad, because this has become Sony's biggest franchise and the most charismatic cast of characters ever in PlayStation history. This outing makes them feel typical, run of the mill, everyday action/adventure characters and the plot feels recycled from both previous games. Bad Dogs, bad! With a wonderful world to play in and the characters you have developed and you make them feel BLAH! Now with a game series like Uncharted I feel there needs to be a divide between the single player and the multiplayer. 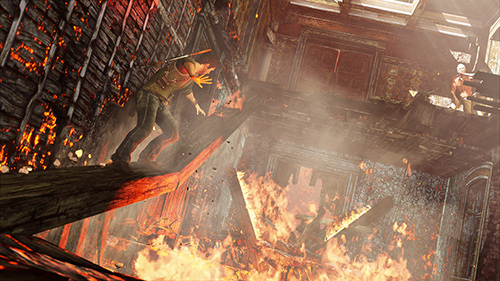 Since Uncharted has always been known as a single player focused franchise. So the multiplayer/co-operative modes will be reviewed separately. The sad thing is, the multiplayer was improved over the U2. Greatly improved and while that is a good thing. I'm pissed at the thought of Naughty Dog putting more effort into improving that and the single player getting shafted as a result. So here we are. Score time. The gameplay saved the single player from a worst fate. I know I was. Uncharted 3 had a very tough mountain to climb.